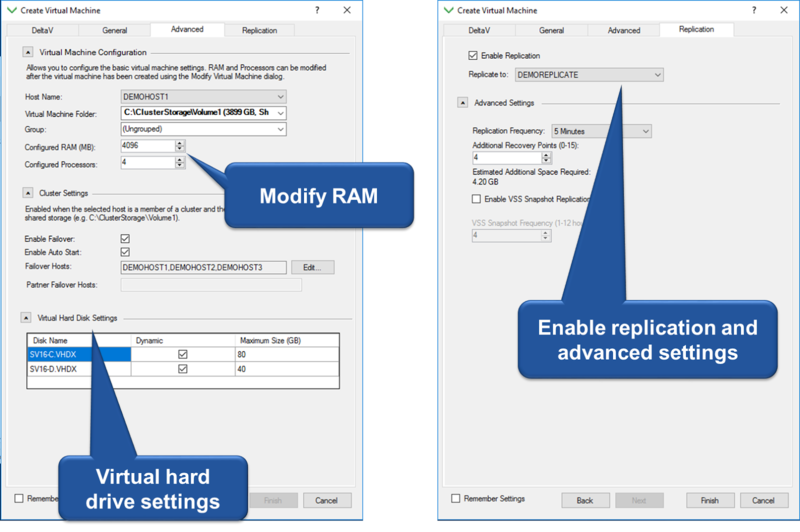 DeltaV Virtual Studio 3.3 has recently been released and I thought I’d brag about some of the new usability features that are included. 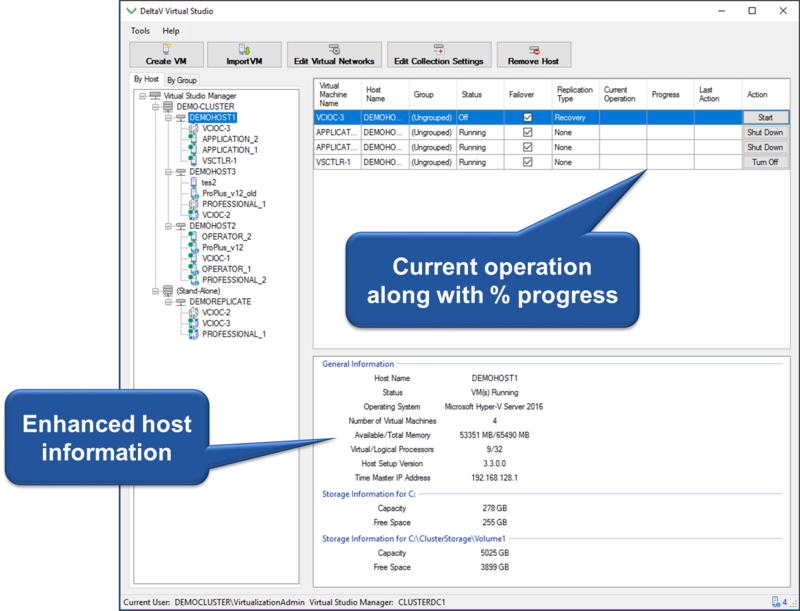 In addition to showing the last operation executed on a VM, we include what’s currently happening along with a progress bar so you’ll know things are moving along. We’ve also enhanced the information displayed in the lower right-hand corner for things like the hosts and VM’s. 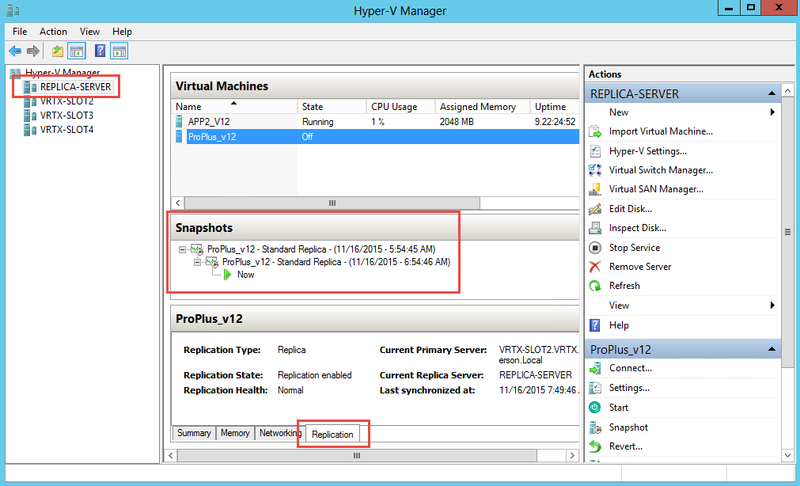 When enabling Replication, the number of restores can now be adjusted, which previously required you to go into Hyper-V. Increasing the number of restore points provides additional protection in case of machine corruption. 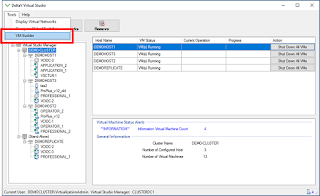 When changing the restore point number, DVS displays the additional hard drive space in the storage array that will be consumed. For performance adjustments, the replication frequency can be slowed down – this might be acceptable for non-persistent nodes like operator stations. When you click the final Finish button, DVS will go out and spin up all the selected VMs – time for a couple of cups of coffee or even lunch. 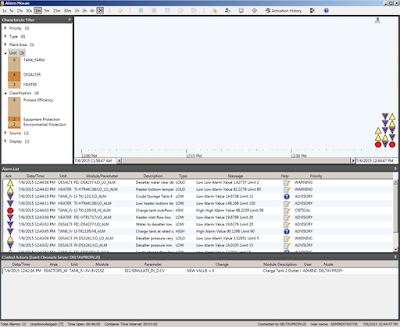 DVS 3.3 is available at no charge to existing DVS 2.3.1 customers with Guardian Support and can be downloaded from the Guardian website. 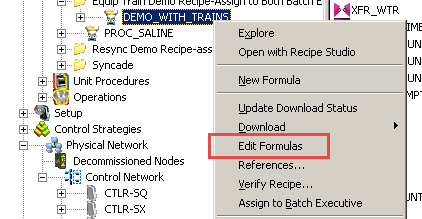 One of the features in DeltaV version 13 is an easier way to manage recipe formulas. 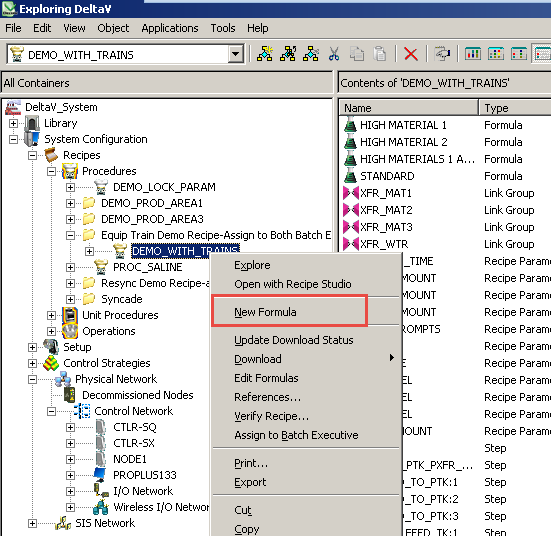 When there are dozens of formulas with hundreds of parameters for a given recipe, viewing and editing the values wasn't all that easy prior to V13. 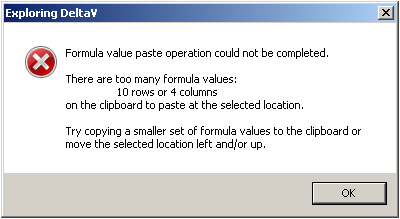 We now have the ability to copy, edit and paste formula values with Excel. From here, I can change any of the values just by typing into the fields (remember the values contained within the <> are default formula values). 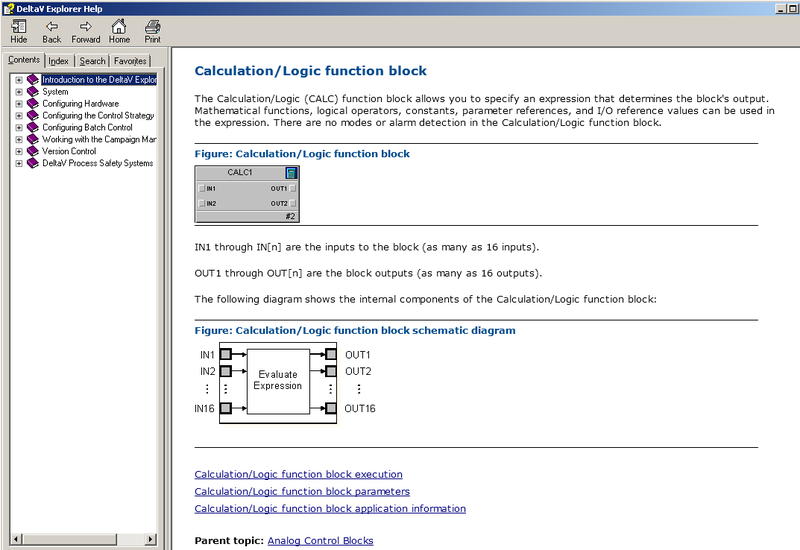 But instead of 10 parameters and only 4 formulas, I could have a lot more, making this a less than ideal interface. You can make any required changes to any of the formula values. 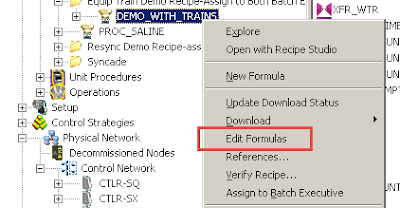 What you can’t do is add a recipe parameter (that’s pretty straight forward, right?) 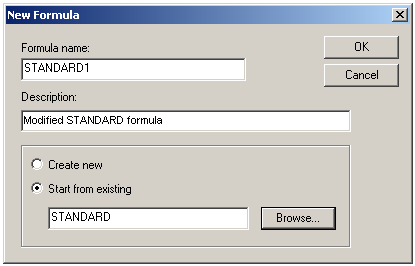 or add a new formula (maybe not so obvious – I’ll come back to that in a minute). 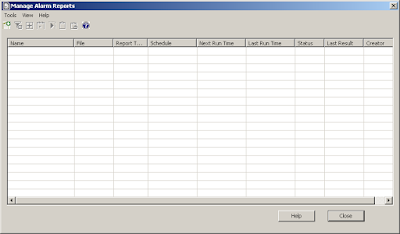 You could create a master formula Excel file and use a different worksheet for each recipe. 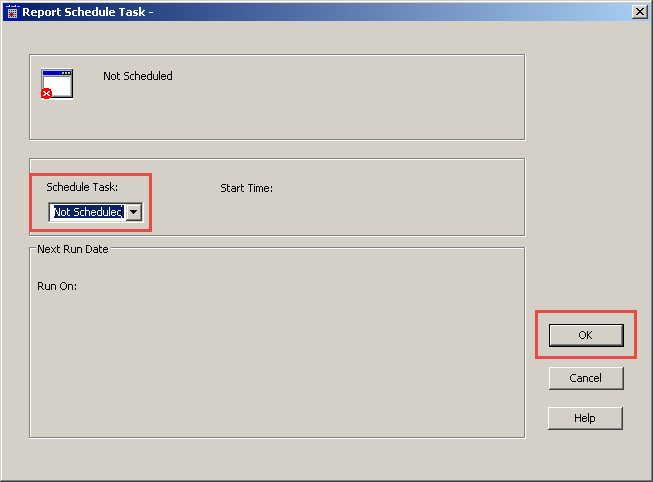 You need to check the “Operator can load” box which will then cause a Yes to appear in the “Release to production” column in the Explorer view. 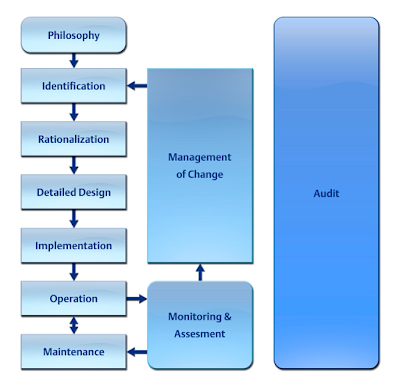 Alarm Management is a big focus of DeltaV version 13, helping our customers become compliant with ISA 18.2, which provides a roadmap for compliance across all stages of alarms, from identification to implementation and management of change. 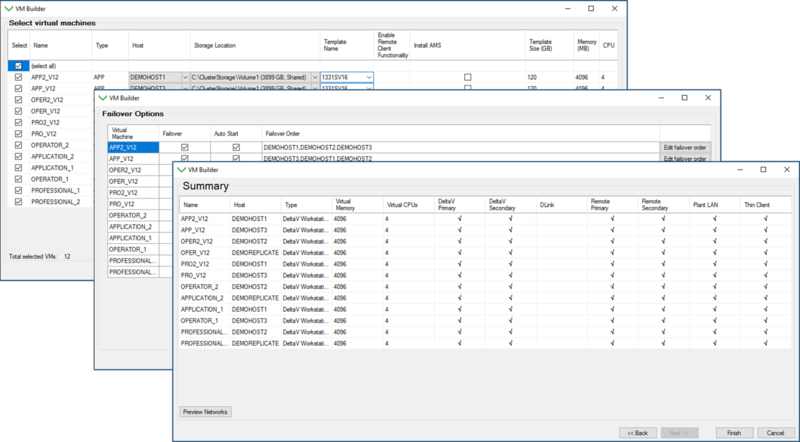 One of the tools we’ve included in V13 is an Alarm Audit Reporting tool, allowing you to compare alarms as they are currently set online in the controllers to how those alarms are configured in the DeltaV database. 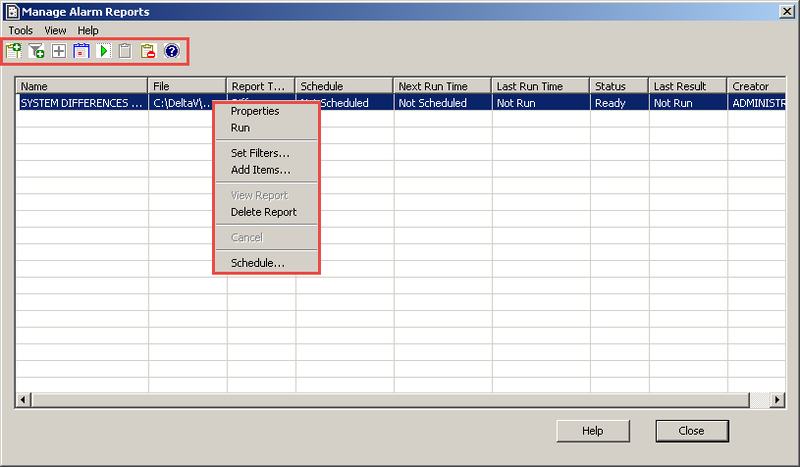 Now here’s an important safety tip – if you hit cancel on any of these dialog boxes, it’s going to take you all the way back to the Manage Alarm Reports view L - just be careful. So out of 84 process alarms, I’ve got one difference between the controller and the database – my high alarm on LIC101 is configured for 90, but the online value is 95. 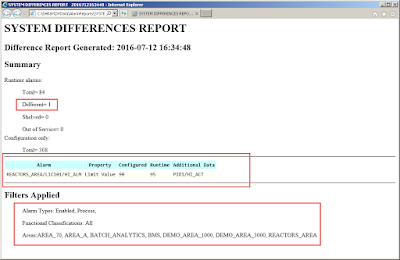 Both an XML and HTM file are generated when you run a report, so it’s highly portable. 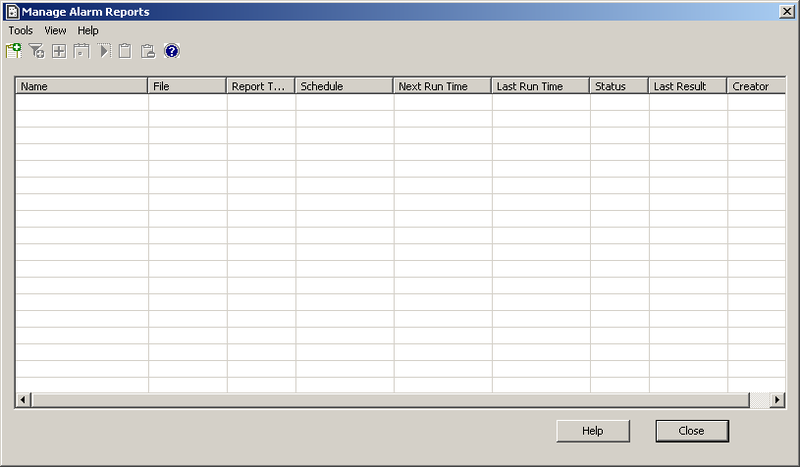 And you don’t have to be inside the Alarm Report application to generate reports. There’s a command line executable in the DeltaV/bin directory named SAMAlarmReports.exe – there’s a full explanation of how to use the executable in the help file associated with Alarm reports. 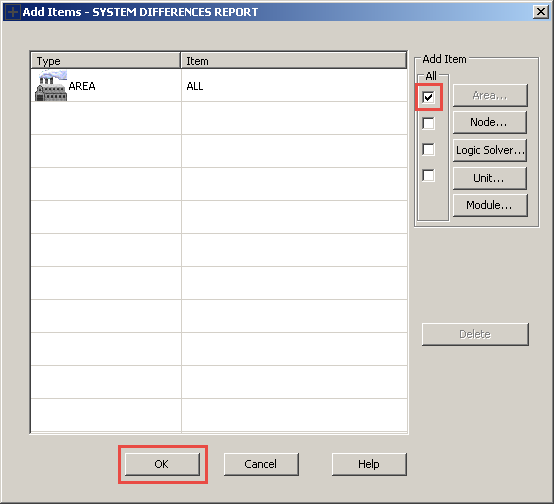 So a great use example would be to automatically generate a differences report as part of your plant’s shift turnover procedure – using, of course, DeltaV Logbooks. 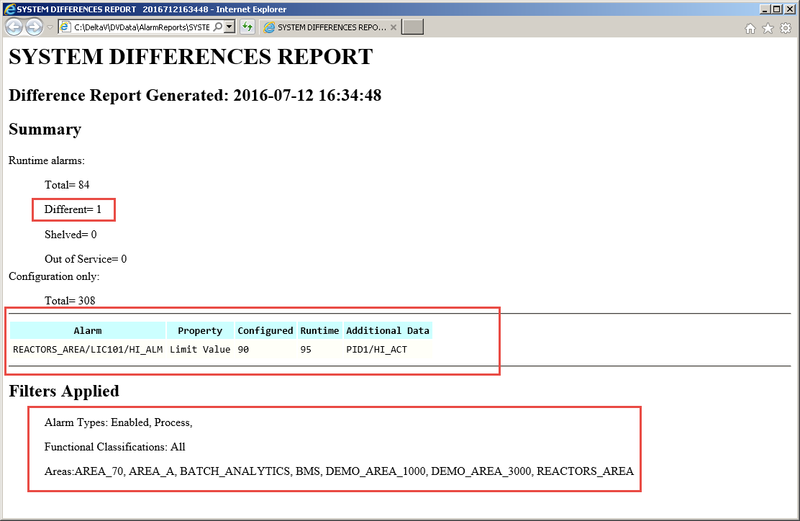 Another use would be to generate a runtime report for a specific unit or units at the beginning or end of a batch. 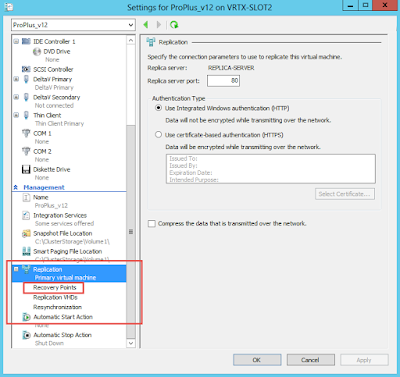 One of the cool features in DeltaV Virtual Studio (DVS) is the ability to provide disaster recovery capabilities using Virtual Machine (VM) Replication. 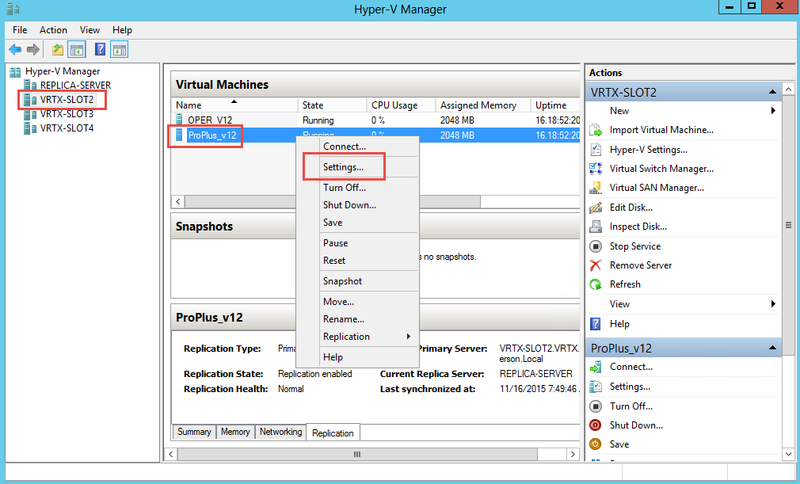 VM Replication creates and constantly updates a replica image of a running virtual machine in a separate cluster or replication server. 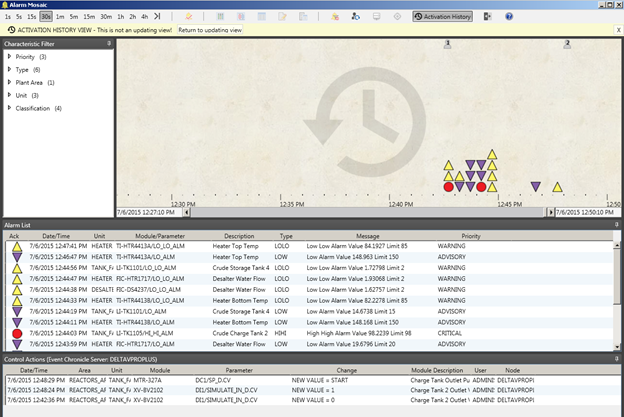 By locating the two clusters in different locations, a disaster in one location can be mitigated by starting up the replica image in the second location. 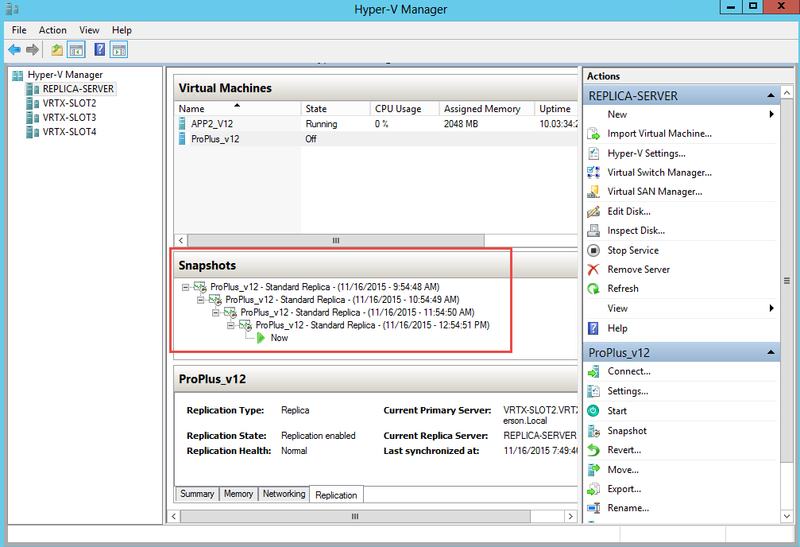 Now in addition to disaster recovery, virtual machine corruption can also be addressed with replication. 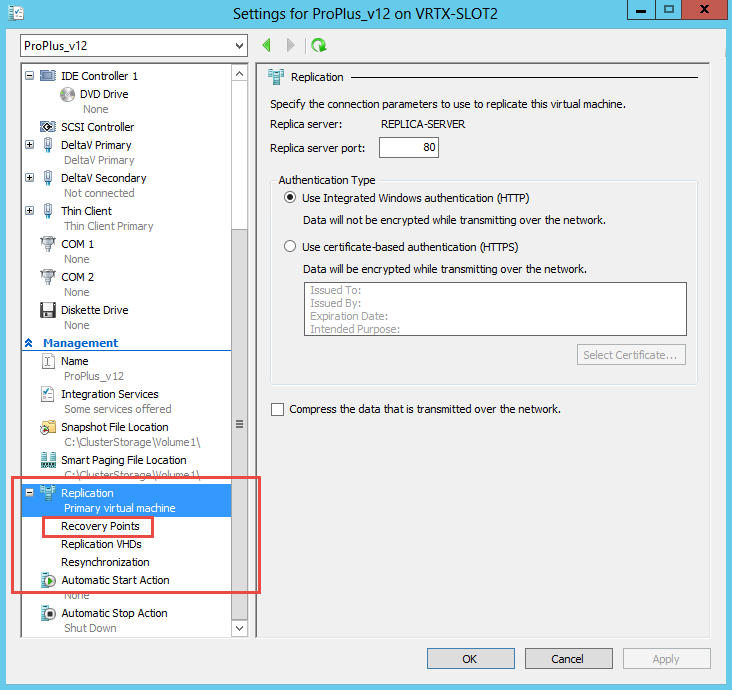 By default, VM Replication within DVS provides two restore points, allowing recovery from an image that is up to two hours old. 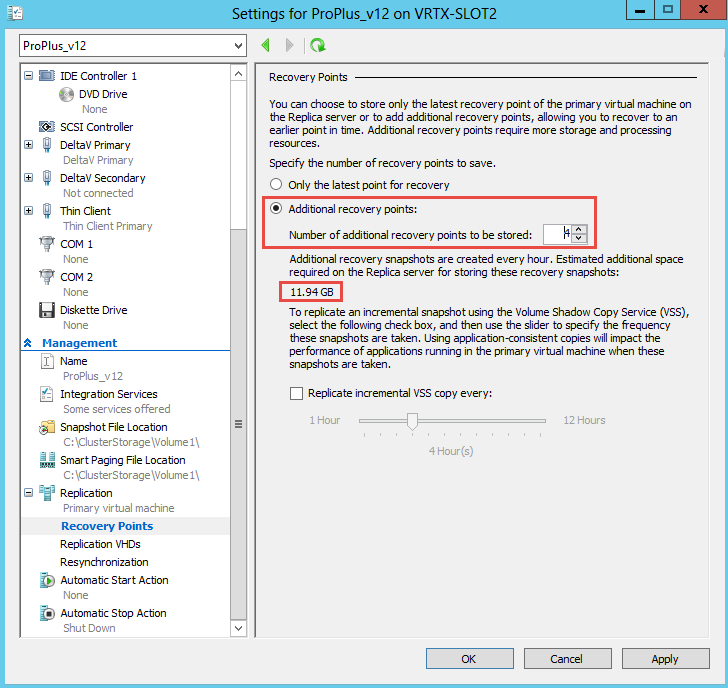 Here’s the procedure to increase the number of recovery points and select the required recovery point if a corruption occurs. A couple of important points before I go on – increasing the number of recovery points increases the disk space requirements for the replica image. 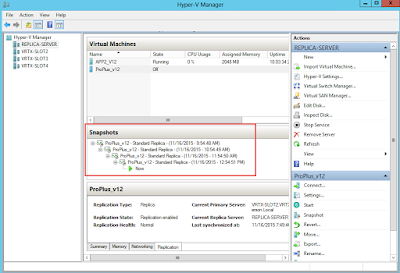 Also, adjusting the number of recovery points has to be done in Hyper-V, not DVS. 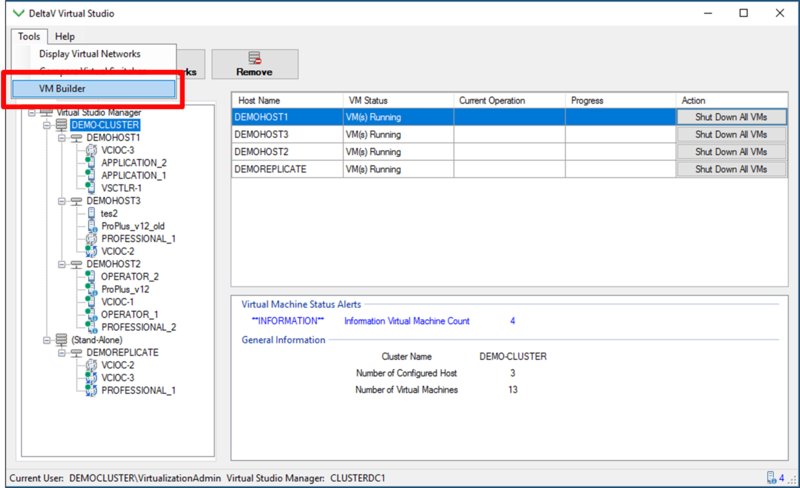 In next year’s release of DVS, version 3.3, you’ll be able to modify the number of restore points from directly within DVS. 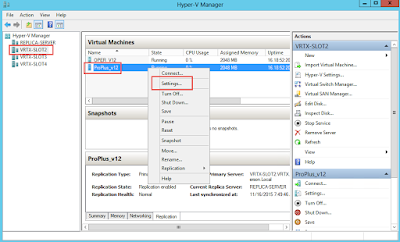 If a corruption is ever detected in a primary virtual machine, use the Hyper-V manager to start the replica image and pick a recovery point. 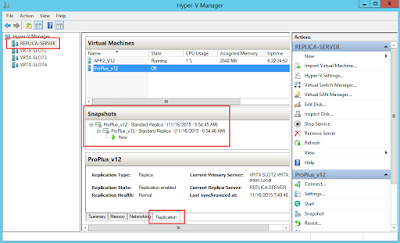 DO NOT USE DeltaV Virtual Studio to start the replica – this will automatically use the most recent snapshot and will discard all the other snapshots. 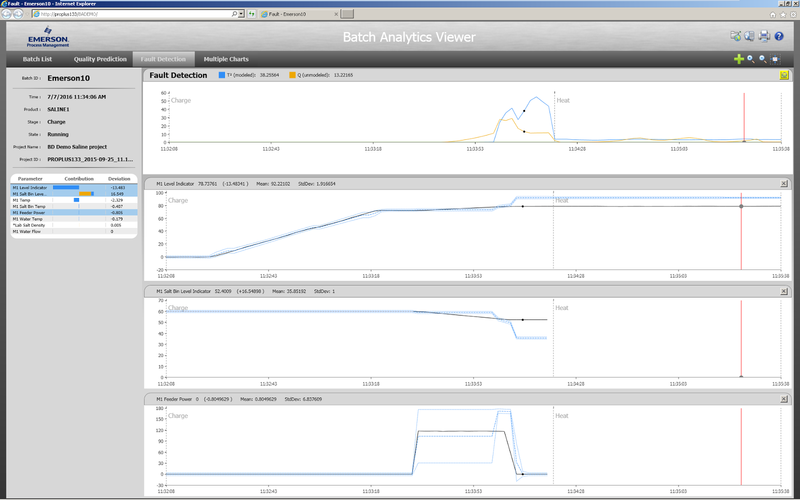 We released our Batch Analytics (BA) application with version 12 of DeltaV and provided some additional enhancements as part of version 13. 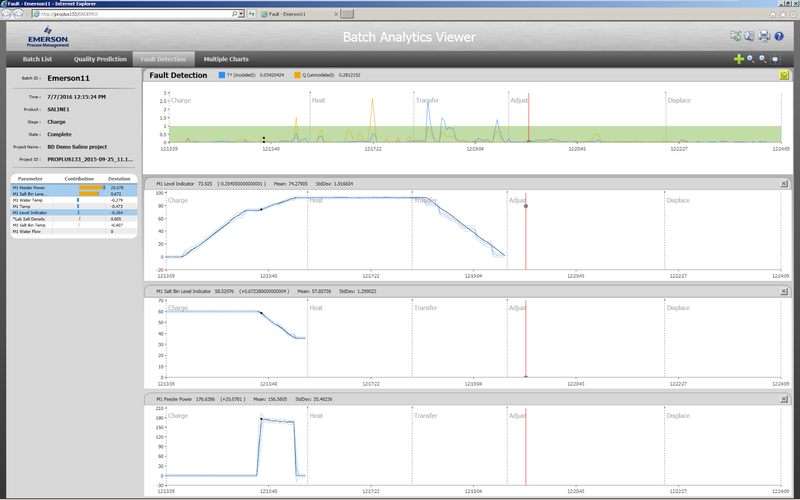 BA uses Multivariate Analysis and Dynamic Time Warping to detect process faults, the reasons for those faults, and predicts endpoint quality, all in real time. 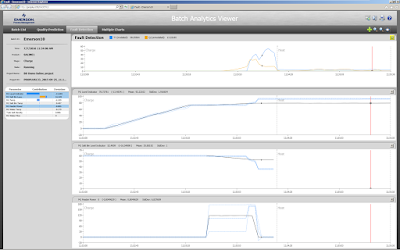 So instead of having to wait until the batch completes to find out there was a problem, fault and quality issues can be examined while the batch is still running. 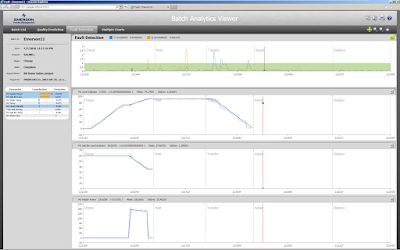 This allows operations and engineering personnel to make better decisions that could correct a quality issue, dump a bad batch early, or schedule maintenance for when a unit is not in use. The black lines above are the actual parameter response, while the dashed and dotted blue lines are the expected, modeled response. For instance, you can see that M1 Level didn’t increase as much as the model thought it should have and the Salt Bin Level didn’t drop as much as the model predicted it should have. 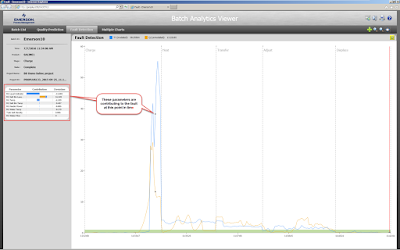 Notice that the mixer and salt bin levels followed the predicted, modeled response. 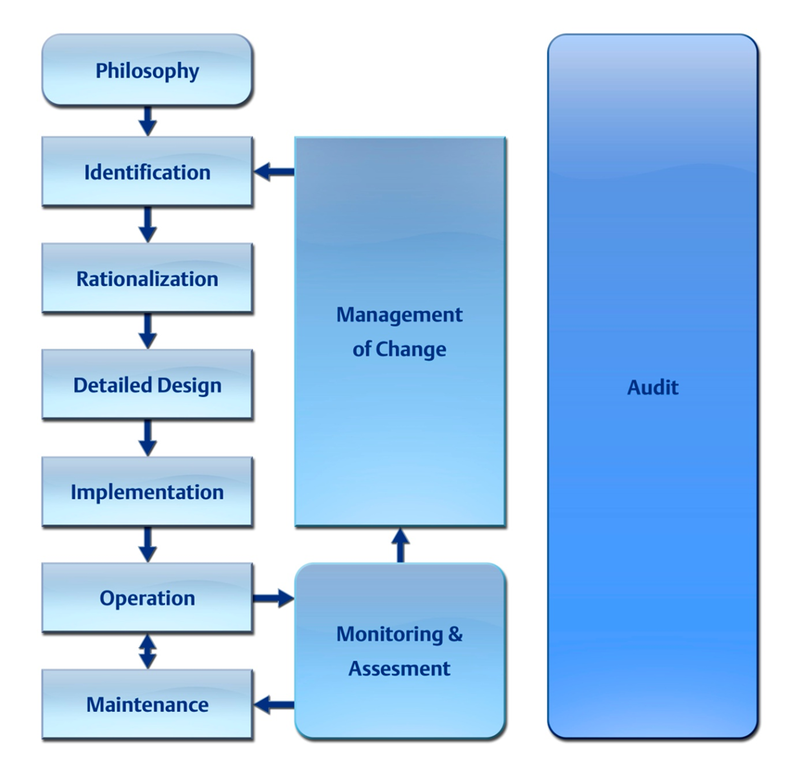 This can provide a great tool for training operations personnel to understand what “normal” is to be better prepared for process upsets and faults. 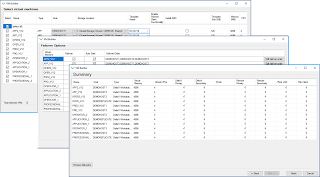 It’s been a while since I’ve posted anything, but we’re right around the corner from releasing version 13 of DeltaV and I wanted to let you know about a really cool new feature – DeltaV Alarm Mosaic. 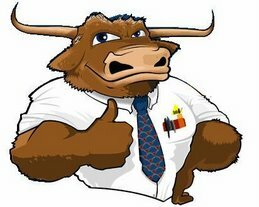 Alarm Mosaic is part of our focus on Alarm Management and helps our customers become 100% compliant with ISA 18.2, the Alarm Management standard. Each column is an adjustable time slice – from 1 second to 4 hours. 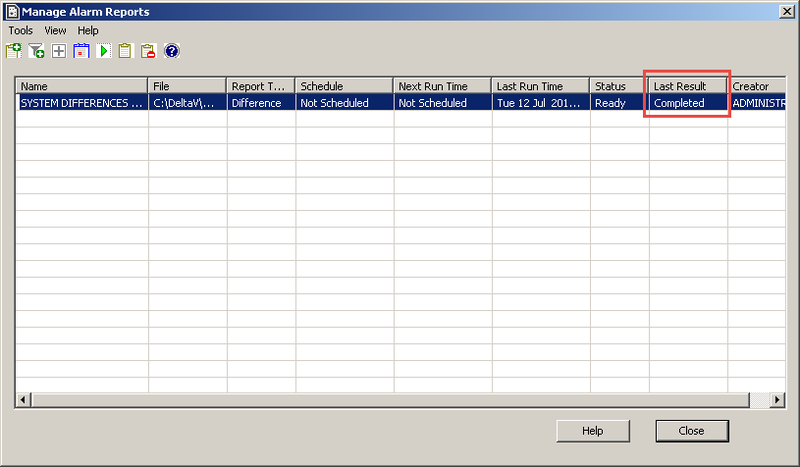 Within each column, the alarms are stacked with the most recent on the bottom. Different visual indicators let you know which alarms are active acknowledged, active unacknowledged, and inactive unacknowledged. From within Mosaic, you can acknowledge alarms, call up faceplates and detail displays within DeltaV Operate, and even launch Alarm Help. 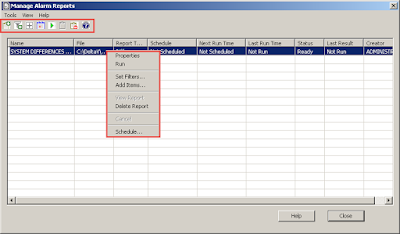 To help in root cause analysis, operator actions are overlaid with the alarms. 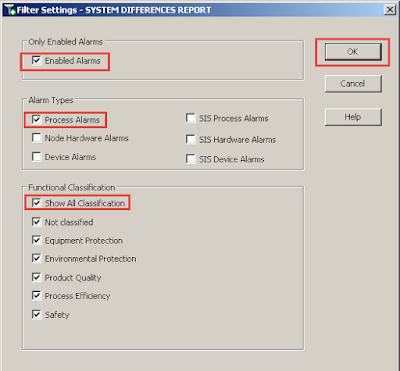 In addition, the Alarm Characteristics panel allows the user to highlight alarms using 7 different properties including classification, area, even which displays the alarms are contained on. 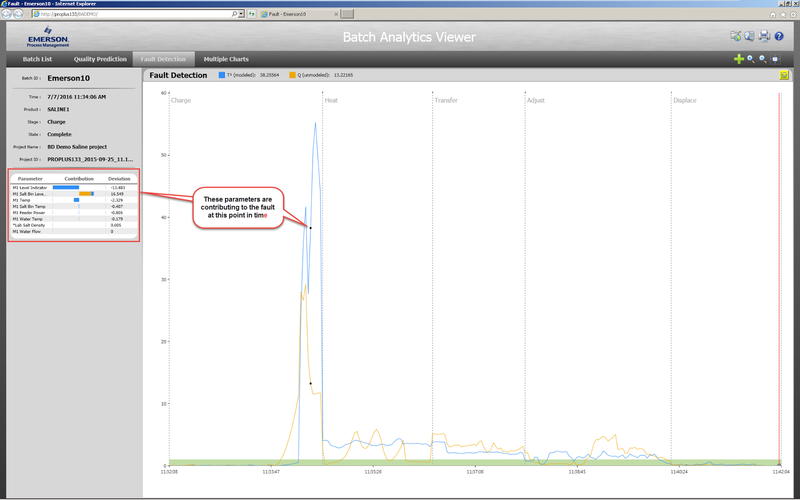 A really neat feature is the History Activation view. Once an alarm flood has been successfully dealt with, the Mosaic view won’t show any alarms. 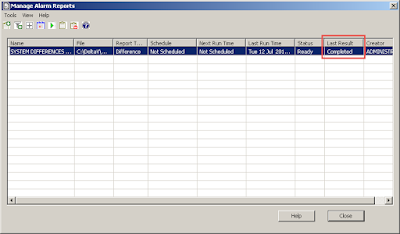 By switching over to the History Activation view, the alarm flood along with operator actions can be viewed from data stored in the Event Chronicle, providing a great tool to use at shift turnover meetings and as a general teaching aid. 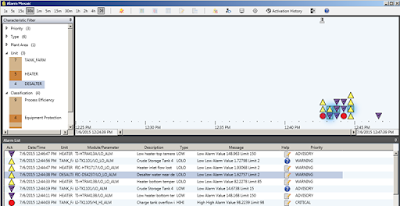 Check out all of the Alarm Management tools on the DeltaV website. So here’s a shameless plug for a great YouTube video that’s about to go viral. For use with our Electronic Marshalling, we’ve released the CHARM Diagnostic App for the iPhone for interpreting and diagnosing the LED lights on CIOC Characterization Modules. Using either the built in camera or manual detection, the color and blink rate of the CHARM’s LED is translated into useful diagnostic information. In addition, wiring schematics for all 21 available CHARM types can be called up to ensure proper wiring and aid in troubleshooting. We spared no expense in getting some top Hollywood talent to promote this new app – you can check out the video here. Sometimes it’s easier to get your point across with less; other times you wish you had more time or room to explain yourself. Submitting an abstract for Emerson Exchange is like that – you end up having to be creative to get your point across in the limited number of characters you’re allotted. One place you hate to be limited is in your alarms. 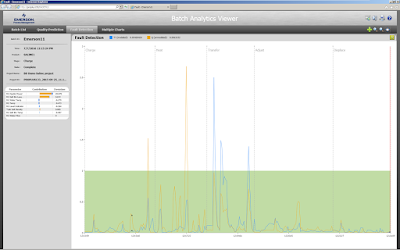 The more information you can provide your operators, the better they’ll be able to respond. 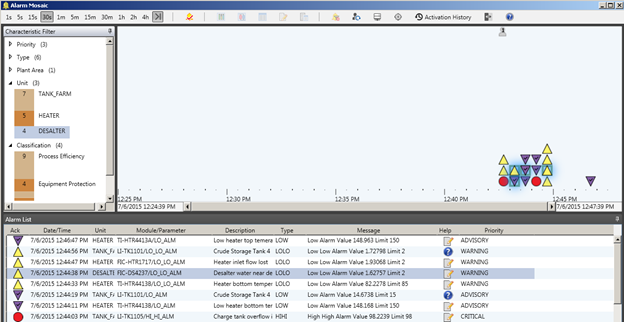 Back in version 11 of DeltaV, we added Alarm Help functionality, to capture and display detailed information about an alarm, what to do when the alarm comes in, and what might happen if no action is taken. 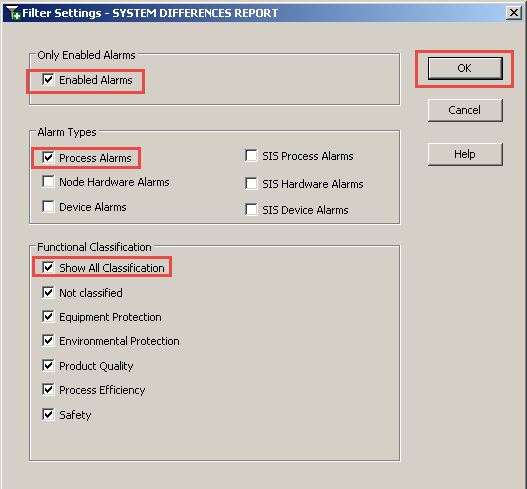 And while you can get this detailed information for any individual alarm, it would be nice if there was more information available when you look at the Alarm Banner, the Alarm Summary display, or Process History View. 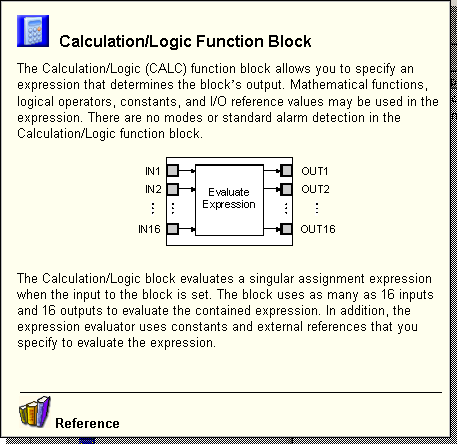 Typically a control module would contain process information associated with a single process signal or control loop. 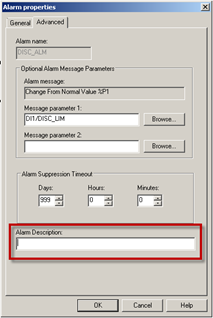 In this case, using DeltaV Alarm Types can provide an acceptable level of detail associated with an alarm. 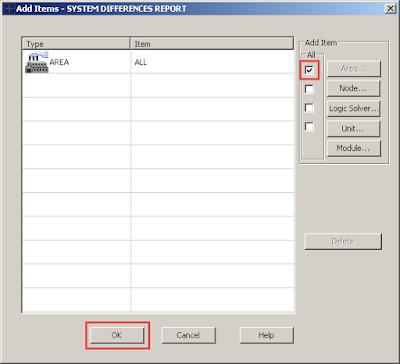 While this may be adequate for single analog control or monitor type control modules, additional descriptive information for discrete types of alarms and SIS SIF modules are necessary. 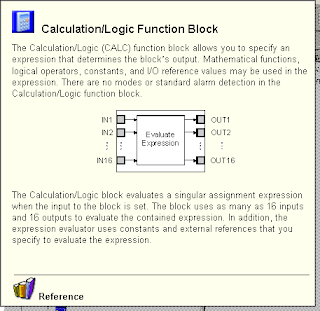 The description shown in the alarm banner and alarm list is associated with the module itself, not the process variables used within the module. Because this information can be critical for the operator to troubleshoot an interlock or safety trip, engineering workarounds have been developed. These include adding additional Alarms Types or new, separate modules to the system whose sole purpose is to provide more descriptive information to the operator when one of these events occurs. We’ve given a helping hand to Books On Line in Version 12. 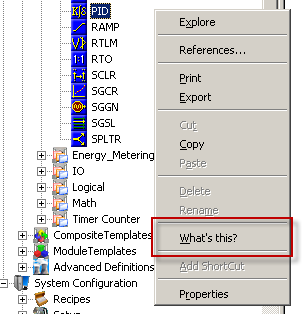 Never fear, you’ll still be able to launch BOL right from the task bar in DeltaV Explorer, just like you always have. 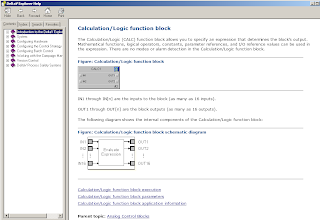 The first change you’ll notice is when you right click on something like a function block. Prior to v12, you’d see a menu like this one with one of the choices being What’s this? 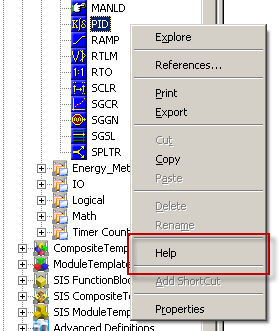 In v12, we’ve replace the words “What’s this?” with “Help”. Not a big deal at all, and rest assured Help and What’s this? are going to get you to all the information you need. We’re using the same compiled HTML code to convert the mini helps into the rest of Books On Line, centralizing all the help information within DeltaV. 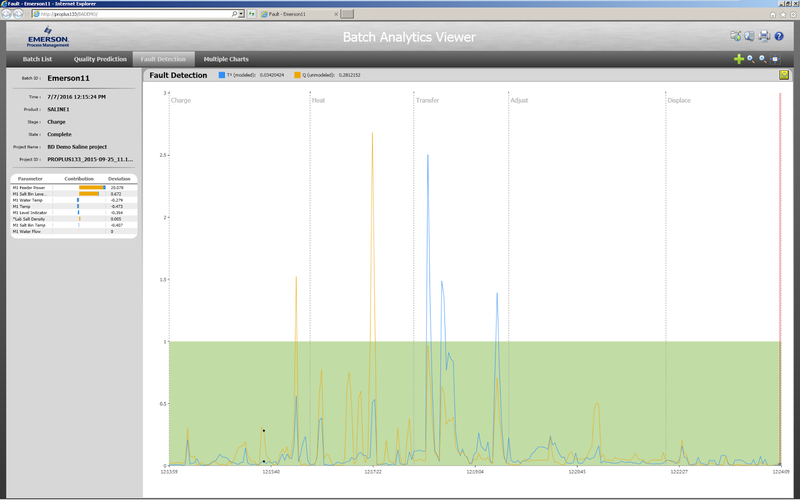 Access to the more detailed information is easily available from the links at the bottom of the topic overview. 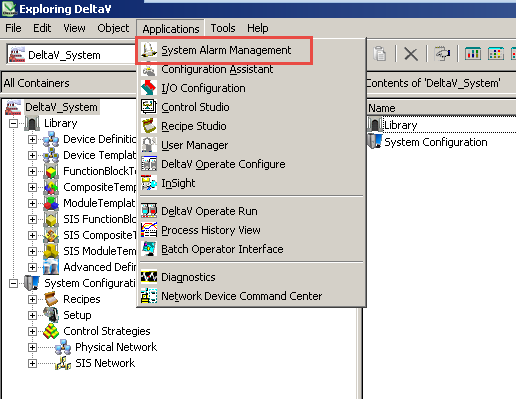 One other change is the location of the compiled HTML files – they’re no longer in a BOL folder on the C:\DeltaV drive of your DeltaV machine. They’re located in a Hlp folder in the same location. 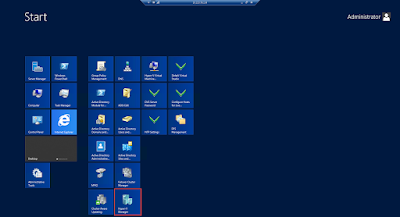 You can still copy this folder off and drop it onto your laptop’s hard drive for easy access to Books On Line wherever you are. 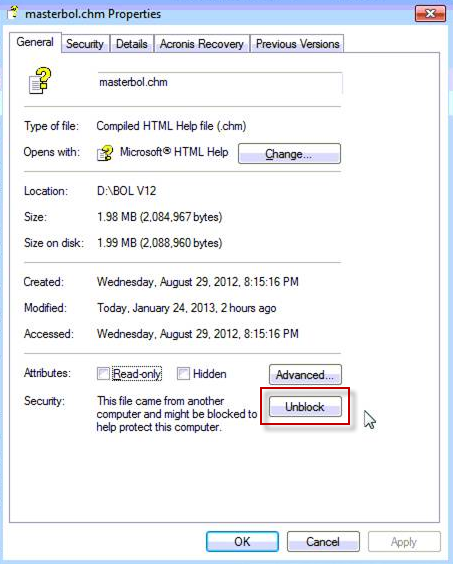 Go ahead and click on the “Unblock” button and things should work just fine. 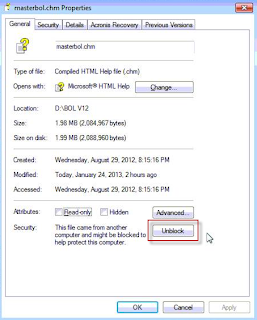 Also, you’ll most likely have to put the BOL folder on your local PC, since you won’t be able to launch compiled HTML files over a network share. Thanks to Scott Thompson at RE Mason for these .chm tips. The opinions and views expressed here are the personal opinions and views of Bruce Greenwald. Content published here is not read or approved by Emerson Process Management before it is posted and does not necessarily represent the views and opinions of Emerson Process Management. ©2016 Bruce Greenwald. All Rights Reserved.